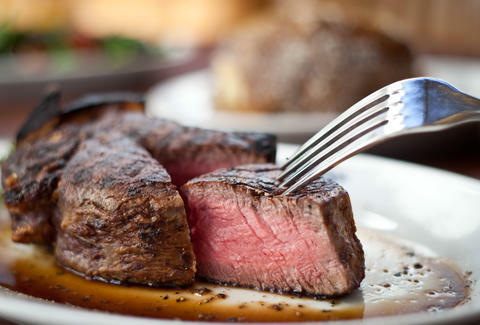 Steak: it’s what’s for dinner. Or, well, it should be, because it’s delicious. Thankfully our city doesn’t lack USDA Prime chophouses, especially ones of the indie variety. So really, if you were thinking about hitting up one of the many chain steakhouses in the area, don’t. 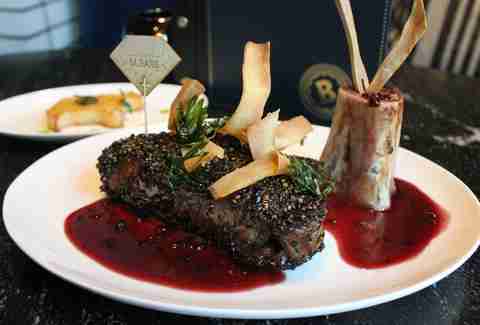 Instead, toss on some fine dinner attire and head out to any of these restaurants that specialize in tasty cuts. No offense, Outback, you’re great and all. But these are better. The city’s paleo patriarch has been giving us our daily protein for three decades now, and it isn’t even close to slowing down. This place is expense account central, what with a three-figure Wagyu strip-loin kicking off the menu (just think of all the backroom business deals that have been made over this dish). 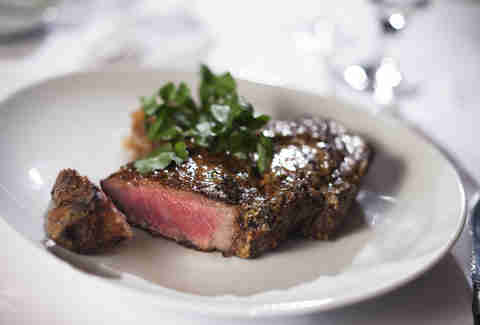 The a la carte cuts are the stars here, with the 100-day-aged ribeye and the Kobe cap steak being the star of the stars. If you’re not willing to pay more for dinner than you pay for your monthly heating bill, hit up the bar menu, which includes three new burgers. Brian Piccini and Chris Coombs took over a cursed South End restaurant space and turned it into a meaty paradise. 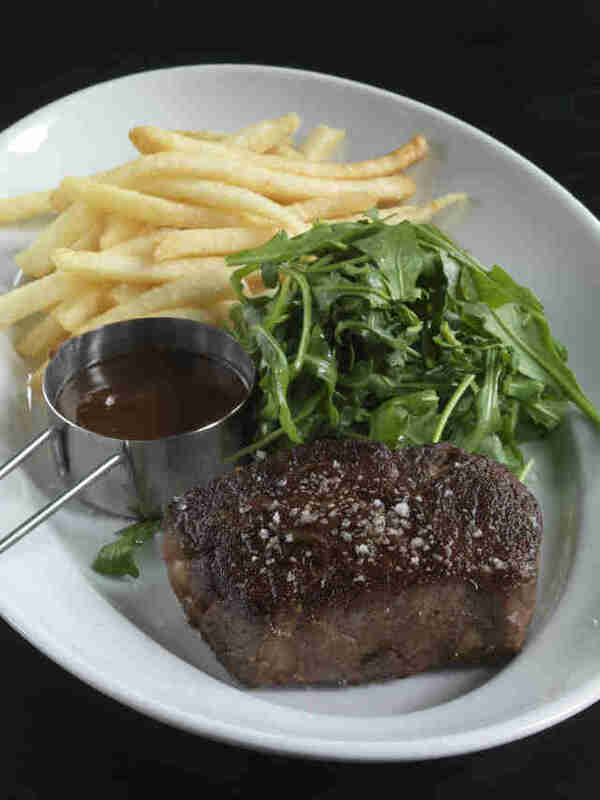 The steak frites menu is everything you could want from life: pick your cut (hanger, strip, skirt), pick your sauce (bearnaise, bordelaise, chimichurri butter), then bask in the glory of the bottomless fries bowl that comes to the table. All the desired steakhouse accoutrements are here, too, from the oysters to the popovers to the roasted bone marrow to the leaning tower of onion rings that simply must be ordered for the table. The name is a little unnerving -- was that the last sound of your dinner? -- but otherwise this is paleo nirvana. There are no less than 14 different steak options on the menu, all served with bone marrow butter, and roasted garlic. Want a little surf with your turf? Add on some jumbo shrimp. Want to finally take advantage of that expense account you’re too afraid to use? 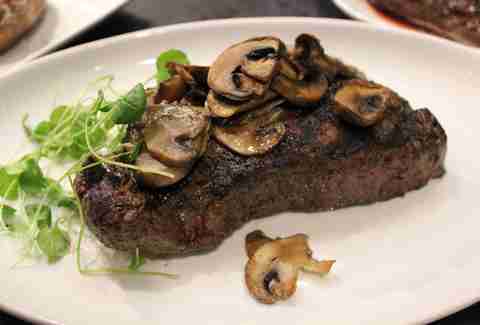 Break in the company credit card with the 6oz, $160 Japanese Wagyu sirloin. This Back Bay institution is so entrenched, you almost take it for granted -- until you crave a gluttonous, meat-centric celebration and beeline it to Boylston St. There is no reinvention of the wheel here, but rather a celebration of chophouse classics: prime Midwestern steaks aged at least 30 days on the bone, accompanied by sides like creamed spinach, sauteed mushrooms, and a jumbo baked potato in a staid, dark-wood paneled setting. You can even lure out a pescatarian for an evening, given that the swordfish steak is the restaurant’s unofficial signature dish. How is it that one of the area’s most exciting new steakhouses opened all the way out in Burlington? Whatever the why and how, the cavernous suburban restaurant has quickly made a name as a modern steakhouse worth the drive. The delight is in the details: the house made flavored salts that season the cuts; the tomahawk steak presented tableside, then brought back to the kitchen for carving; the polenta cakes shaped like little cows that accompany each steak. Bancroft's modern iron and glass decor is a refreshing detour from the standard dark wood and brass, and both the cocktail and wine programs demand you designate someone else to drive home. OK, so, the Angus cows you’ll encounter at this Groton restaurant aren’t actually dinner, but the farm setting underscores the freshness of the menu (most of the produce is sourced from the farm itself). Located inside a revamped barn, the restaurant is down-homey in its aesthetic, but the menu itself is surprisingly sophisticated, yet relatively affordable. 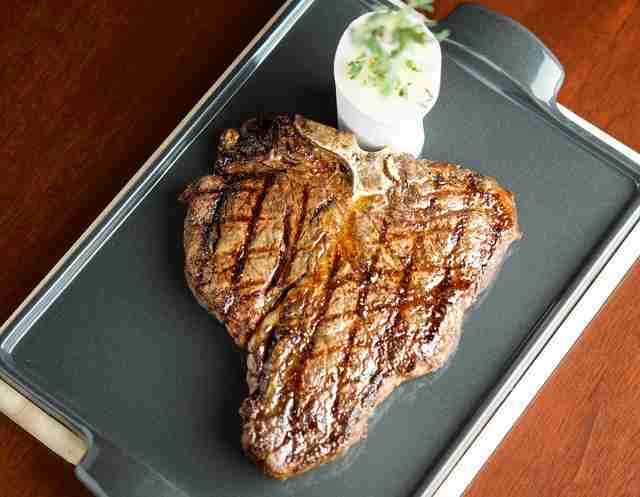 Steak cuts include a bone-in rib-eye and a 48oz porter, and all come with two farm-fresh sides. Don’t bypass the cocktail program, which also incorporates a lot of the farm’s seasonal output. 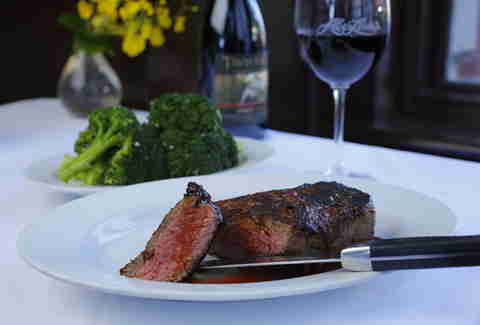 Are you familiar with the gastronomical wonder known as the beefsteak meal? If not, head to Flank to acquaint yourself. 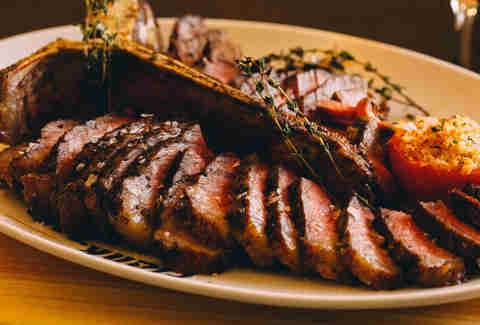 The banquet-style dinners, once a 19th century-celebration staple, are coming back, and this new Waltham spot does it right: three or four family-style courses of sliced steak and accompaniments that you’re encouraged to eat with your fingers. Yep, your fingers. If you insist on the dignity of silverware, go big with the 44oz porterhouse or the 50oz bone-in ribeye topped with a dollop of black truffle herb butter. A steakhouse speakeasy is about as cool as it gets in Boston, and this little surprise is tucked inside jm Curley, one of the city’s greatest bars. There’s no website and only the tiniest of signs pointing you to a curtained doorway in the back of the bar. Beyond that burgundy curtain is a small, dreamy chophouse doling out classic cocktails (Ward 8, French 75), caviar service, a wedge salad, and surprisingly affordable steak cuts, adorned with the likes of bone marrow and foie gras butter. Looking to impress a date/client/IRS auditor? Bogie’s is your meal ticket. Meaghan Agnew ate a giant steak. Follow her meat-eating habits on Twitter and Instagram at @meaghandeth.